The ISKA is organizing an international Riders Tour. This season there are 2 Tour-Stops. One of the tourstop will be the ISKA Snowkiting Worldchampinchips in Slovenia. You can also check this snowkiting open event about amateur and pro’ Kitesurfers & Snowkiters to compete against each other. Kite Surfing: 7 Ways to Practice on Snow Kiting, Land Kiting and Sea Kiting. Snowkiting or also known as kite skiing, is a winter sport, using the kite power to glide on snow or ice. The sport is quite the same as the water-based kiteboarding, so a mixture of snowboarding and kitesurfing makes snow kiting. The way of using the kite is the same, but in different ground. The snowkiters use large kites that makes them travel across snow and go uphill and downhill with the wind direction. That’s the difference between snowkitng or snow kite boarding, and the other alpine sports. Nowdays, the snowkiting is becoming incredibly popular in places related with snow and skiing, such as Russia, Canada, Switzerland and in the Northern United States. 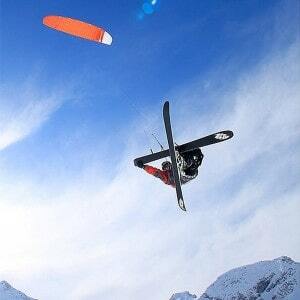 One thing is sure, once you get on the snowboard, you wil become obsessed of snowkiting. If you are looking for a new snowboard for snowkiting, then you should look for a twin-tip, and especially the ones with increasing sidecuts are so much better. This winter is the best time to learn the basics of snowkiting. To a have good snowkitng equipment is important to your success. ISKA focuses on choosing the correct equipment for each lesson. If you are a snowkite beginner, you should wear the same that you would wear when you are skiing or boarding, a helmet and goggles, gloves, ski boots and warm jacket, our snowkite center provides all kite equipment such as snowkite harness and kites. All the skills learned in winter, on the snow, would be very useful for those who are keen on kiting on water in the summer. You can use skis or snowboards for snowkiting, it doesn’t matter, but if you are a snowkite beginner and you want to learn how to snowkite, than you should start your snowkiting lessons with skis. It will be better if you are an intermediate skier or boarder or if you have basic knowledge of how to edge a ski or board. That will be the best option of making the most of your lesson, because anytime we have to spend time on instructing on ski or snowboarding, is a lost time from your kite lesson. The International Snowkiting Association is the best snowkite center where you can get the best snowkiitng lessons. You can follow this link to learn more about snowkiting lessons and courses.